Playing the charismatic, expert swordsman Syrio Forel on the HBO series Game of Thrones, actor Miltos Yerolemou showed that he is pretty skilled performing with a blade. Now you can prepare for a ton of suggestion that he'll be trading his broadsword for a lightsaber in Star Wars: Episode VII. If the BBC can be believed, then Yerolemou has become the latest actor to join the cast of J.J. Abrams' Star Wars: Episode VII, which is currently back in production. As I'm sure many of you could have predicted, there aren't currently any details available about the character he will play - and LucasFilm declined to comment regarding whether or not the story is true. The movie recently rebooted it's production following a two week hiatus as a result of Harrison Ford's on-set foot injury, but it now seems like things are back in full swing at Pinewood Studios, both in front of the cameras and behind. 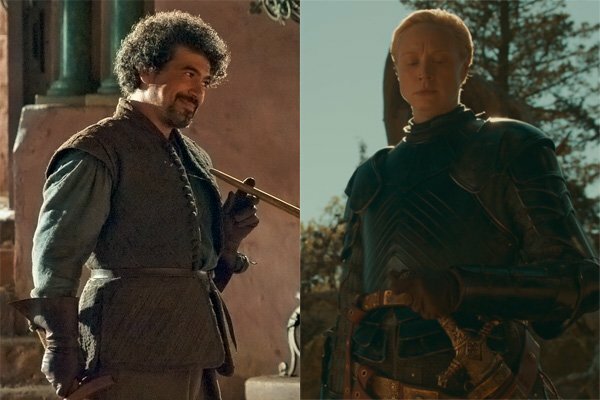 Those who have been following Star Wars: Episode VII's development through production will note that Yerolemou is not the first Game of Thrones star to be cast in the movie. We learned back in June of this year that Gwendoline Christie, best known for her role as Brienne of Tarth, is also going to be featured in the film. It's been rumored that Christie's role - one of the main villains - was originally written for a male actor, but that it was changed to bring the actress on board. Star Wars: Episode VII will be out in theaters on December 18, 2015, and in addition to the names mentioned above it will also feature Harrison Ford, Carrie Fisher, Mark Hamill, Anthony Daniels, Peter Mayhew, Kenny Baker, John Boyega, Daisy Ridley, Adam Driver, Oscar Isaac, Andy Serkis, Domhnall Gleeson, Lupita Nyong'o, Crystal Clarke, Pip Anderson, Christina Chong, and Max von Sydow.